OCN‘s new mystery thriller Neighborhood Hero presents a premise that seems quite familiar: an ex-secret agent uses his acquired skills to bring justice to those who have wronged him in the past. Although this sounds like a story that we’ve seen many times before, Neighborhood Hero‘s layered characters, sprinkles of humor, and story-telling technique is what draws in the audience’s attention. Neighborhood Hero was marketed with a more comedic tone, but the story starts with a darker introduction. The first scene places us right in the middle of a mission in Macao and the quick cuts help us feel the urgency of the situation. Additionally, this setting introduces us with our main characters, and a motivation for the rest of the story. There’s no better way to get to know characters than seeing them act under pressure. Friendly banter between our main protagonist Baek Shi-Yoon (Park Si-Hoo) and his partner Jin-Woo (played by Ji Il-Joo) during duty shows chemistry and comradery between the team, even in the middle of a dangerous situation. Our first glimpse of Shi-Yoon in action portrays him as a dangerous individual who is highly trained in martial arts. As the assignment takes an unexpected turn, a light is shone on the true nature of our characters. Shi-Yoon’s arrogance gets in the way as he refuses to abort the mission despite the warning and orders from the higher ups. His costly decision ends up with Jin-Woo’s death in a noble sacrifice and himself in jail for disobeying orders on foreign turf. While remaining planted as a crime and mystery drama, Neighborhood Hero definitely takes some inspiration from the superhero genre. One of the main themes that it uses is character alter-egos. We are introduced to many characters in the first episode, but as episodes two and three progress, we find out that there is more to these characters than we were led to believe. Our lead character, Shin-Yoon, is a dangerous and calculating individual hidden under the shadow of a socially awkward bartender — sometimes unintentionally. 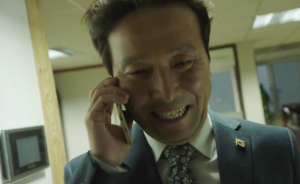 The first impression of Officer Im Tae-Ho (Cho Seong-Ha) is that of a normal father and husband, struggling to pay the mountain of bills piling up. It is only later that we see what he is willing to do to provide for his family. The police officer has a good heart and never crosses the line very far, but is definitely willing to bend the rules. This theme of “more than meets the eye” is what forces the audience to pay closer attention to each character. Camera angles and lighting techniques are often used as hints to who these characters really are. We don’t know very much about the man who subcontracts Tae-Ho do carry out his tasks, but the slightly tilted camera angle and bland yellow lighting may be giving us a clue. Episode two and three continues to slowly take the cloak off of characters like the elderly bar owner President Hwang (Song Jae-Ho) and even the bar itself. While functional as a bar, the building serves as a place for Shi-Yoon to disguise his own intentions and also as a place for other people in the field to gather for various reasons. The bar is a very important location in the show allowing for certain characters’ storylines to interweave with one another. The first three episodes of Neighborhood Hero takes us along the beginning of Shi-Yoon’s journey to avenge his partner and friend, but it seems that history is repeating itself. His arrogance is getting in the way yet again as he neglects any guidance that comes his way. Shi-yoon ignores suggestions from President Hwang and his mother to not act out of revenge as he continues to search for the person responsible for sabotaging the mission. Like the characters in the drama, it seems that Shi-yoon’s plan has an alter-ego within itself. His true mission maybe to ultimately lift the emotional burden off of his own shoulders for the end of his relationship with Seo-An (Choi Yoon-So), his career, and Jin-Woo. Episodes one and two spend a lot of time establishing certain characters like Choi Chan-Gyu (Lee Soo-Hyuk) and Bae Jung-Yeon (Kwon Yuri) who will inevitably tie into the main story in the future. Episode three, on the other hand, focuses on the past elaborating on the brotherly relationship between Shi-Yoon and Jin-Woo and also the romantic interest between Shi-Yoon and Seo-An. Bouncing back and forth from present to past piques our interest and then hooks us emotionally. The pace of the show is more of a slow burn as information gets revealed little by little. But keeping certain information close to the chest certainly plays on the audience’s desire for answers. This allows for exciting payoffs, reveals, and cliffhangers. What are your impressions of Neighborhood Hero? Do you enjoy the way the story unfolds?